Once the Fall weather hits all I can think of is COMFORT food. Riley is a huge fan of pasta so I try to give it an added twist each time we have it. I also make sure that the pasta is whole wheat. My new favorite is to sneak in the vegetable pasta so that Riley and Joe don’t notice their getting an extra serving of vegetables. 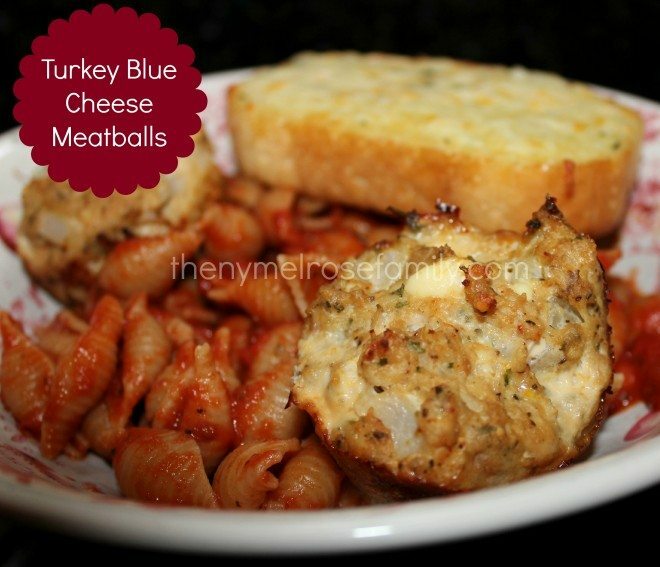 I absolutely love the combination of blue cheese and garlic in these meatballs. They are positively addicting! These meatballs are super, easy to make and they look amazing when they are cooked and browned. The ground turkey in these meatballs makes the meatballs difficult to form because of the consistency of ground turkey, which is why a muffin tin works perfectly and it makes clean up speedy! I promise you will not be disappointed! They’d work really well as a mini meatball appetizer as well. A tantalizing combination of blue cheese and garlic make these meatballs out of this world. Spray a muffin tin with cooking spray and set aside for the meatballs. Mix all ingredients together in a large bowl and use your hands to roll meatballs into muffin size balls. 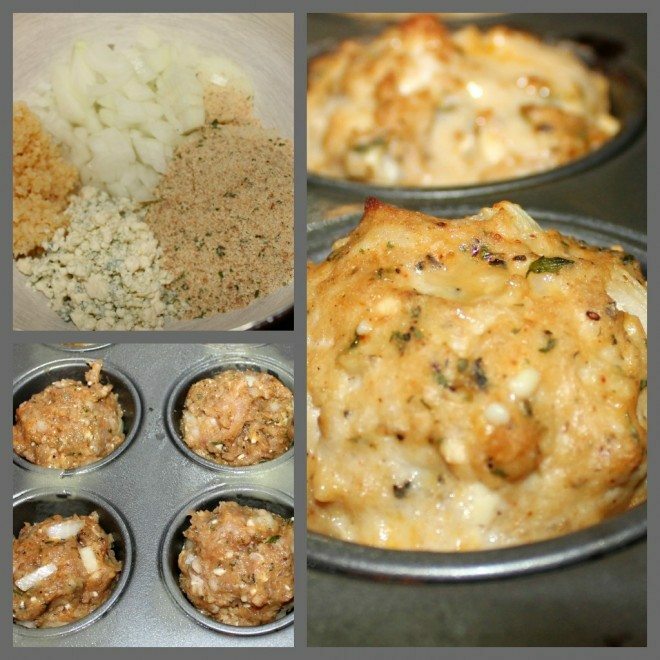 Place the meatballs inside the muffin tin. And I can rate the recipe??? So cool!!! These look delicious, Jenny. We love anything with blue cheese in them around here! Those look divine! I love anything with cheese! Thanks for sharing at the Pomp Party! Hope to see you back next week! These look scrumptious!! I’ve pinned these to try, really soon for sure! Thanks for sharing, can’t wait to eat these. Clever to use the muffin tin to form them. I use a cookie scoop for my turkey ones. I will give a try! Have you been to the Meatball shop in the city? Fun place. I got their cookbook, and the meatballs turn out great in case you are looking for more “ball” recipes sometime. HAPPY SATURDAY SHAREFEST…if only I could eat dairy, those look so decadent and delicious. If these taste as good as they look, I’ll be in Heaven. Pinning to try these later, they look so yummy, and I LOVE turkey everything. Putting them in a muffin tin is genius! I wish I would have thought of that I’ve been searching for the perfect meatball recipe because the ones I’ve tried haven’t come out so good. I’ll have to give this one a go they look super good. Mmm these look awesome! Would love it if you linked up on my blog hop http://www.w-t-fab.com/search/label/bloghop. Also let me know if you’d like to follow each other! Just from reading and seeing this, I am in love with it!